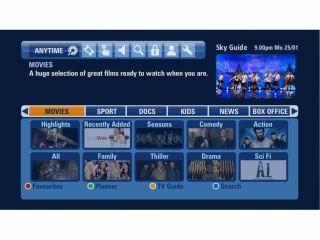 Sky is still actively looking to roll Anytime+ out to other ISPs with head of television services Kathryn Downward telling TechRadar that the VOD service would not be limited to Sky Broadband customers. Sky has insisted before that it will not limit Anytime+ to its own broadband subscribers, reiterating to TechRadar that its decision to limit it at launch was for practical considerations. When asked whether talks were still ongoing, Downward replied: "Absolutely." "Limiting it to Sky Broadband meant that we could ensure that any problems were not with [other ISPs] networks," she added. "It meant we could guarantee the best possible customer experience." "But it is still our intention over time to bring in other ISPs as long as they do the work to make sure that we can have a seamless experience." One of the pre-launch bugbears has been with Sky's decision to limit Anytime+ to standard definition broadcasts, rather than continue the company's laudable efforts to propagate HD. Like the Sky Player service, Downward insists that this is down to satisfying the majority, and that HD is not being ruled out in the near future. "One of reasons we kept HD out [of Anytime+] was customer experience," she said. "If we did do HD, for some groups in our base it would be a near-streamed-experience, but we wanted to get the service launched before we use that. "We still feel that satellite is a great way of bringing HD into the home and it remains the best way to do that."